Americas Cardroom has released the schedule for its second series of “High Five” tournaments and increased the value of the guaranteed prize pools by 20 percent. 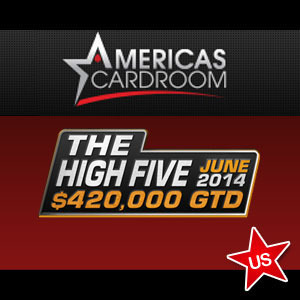 The second Americas Cardroom “High Five” series is going to take place from Wednesday June 11 to Sunday June 15 and will consist of five tournaments each night over the five day period, with events offered in a comprehensive selection of formats and at buy-ins ranging from $1.10 to $530.00. Following the incredible success of last year´s inaugural “High Five” series, Americas Cardroom has increased many of the guarantees for the twenty-five events, with the total value of the series now worth $420,000 (from $350,000), and the Main Event guaranteed for a whopping $150,000. As with the previous running of the Americas Cardroom “High Five” series, a full complement of satellites will be running for the events with the most expensive buy-ins, and it is anticipated that “Passport Events” will also be hosted to offer players the opportunity to win seats in the six most valuable tournaments. In last November´s “High Five” series, Passport Events had a $55.00 buy-in and offered those who cashed in the events “passports” into the six most valuable events in the schedule – including the Main Event. Although the actual value of each passport was only $675.00, it gave their holder´s the opportunity to win their share of $250,000 – not bad for a $55.00 qualifier! It is the beginning of a month once again, so it must be time for an Americas Cardroom reload bonus. Americas Cardroom regularly offers its clients reload bonuses at the beginning and in the middle of the month, and up until this Saturday (May 3) players making a deposit with the Americas Cardroom bonus code “RELOAD” will receive a 100% bonus on deposits up to $200.00. Any player who does not yet have an account with Americas Cardroom – and would like to compete in the forthcoming “High Five” series – will qualify for a 100% match bonus up to $1,000 when making their first deposit using the Americas Cardroom bonus code “PS1000”. This bonus code will also enable players to enroll in the site´s “Elite Benefits” rewards program, which can be an exceptionally lucrative means of adding to your poker bankroll.